MSMA: Review of EPS: Has the funding formula done its job? This is the 10-year anniversary of the State Board of Education special committee report that outlined the Essential Programs and Services funding formula. Put into practice in 2005, the law remains controversial and debate continues about whether it is achieving its purpose of equitable funding and opportunity or needs to be changed. Review of EPS: Has the funding formula done its job? When the Essential Programs and Services funding formula was adopted by the Legislature in 2003, it was designed to ensure all schools had “adequate” resources to provide a core education and was never intended to define everything school districts had to pay for a comprehensive program. The formula attempts to break down a basic education into component parts – from teacher salaries to supplies. It defines what it should cost to make sure each child in the state meets the standards in eight content areas outlined in the Maine Learning Results, spanning English and math to physical education and visual and performing arts. Left out of the mix is the lion’s share of the cost for school sports and other extra-curricular activities and there is no allocation for the school lunch program. The formula also favors larger schools, according to some administrators, because small schools cannot meet the student-to-teacher ratios defined under EPS, particularly for specialty classes like foreign languages, nor can they achieve the economies of scale needed to operate and maintain their buildings on what the formula provides. Michael Cormier, superintendent of MSAD 9, a large rural district based in Farmington, and chairman of the Maine School Superintendents Association Funding Committee, agrees. Even one of the funding formula’s key authors says it doesn’t cover the wide range of courses, like advance placement, designed to challenge all students. “If your charge is to take kids as far as they can go, that’s beyond the Learning Results,” and by extension beyond what is covered under EPS, says Dr. David Silvernail, director of the Center for Education Policy, Applied Research and Evaluation at the University of Southern Maine. Jim Rier of the state Department of Education agrees. “If school districts aren’t exceeding EPS by 5 or 6 percent than they’re underfunding education,” Rier said. What the formula does, both men agree, is to say that regardless of where a child lives, he or she should have access to a core set of programs. “I don’t think it’s perfect,” Silvernail said, but it’s better than the pre-EPS days when school funding was at best arbitrarily based on how much money was available. It also allows the state to recognize that some students need more help than others to succeed. While EPS was designed as a funding model, many say the formula was hijacked in 2005 to serve as a spending cap. It was incorporated that year into a bill – known as LD1 – that the Legislature passed to honor a citizen referendum to have the state pick up 55 percent of the cost of education. That goal has never been met and the state’s share is now projected to be as low as 45 percent in fiscal year 2011. Some speculate that incorporating EPS as a spending cap into LD 1 was payback by the administration for the referendum it had vehemently opposed. It is now used annually in a report produced by the State Planning Office that says school districts are the worst offenders of over-spending because they exceed EPS-defined costs. In reality, a majority of school districts were over EPS when the cap was adopted and that trend continues, with 80 percent over in fiscal year 2007, and 82 percent in 2008 . In fiscal year 2009, the report says, 88 percent exceeded EPS, but that was after the Legislature altered the funding formula to save $36 million in order to help balance the budget. To save that much on the state side, the Legislature cut the cost of education as defined by EPS by $66 million. With the overall base or EPS-defined cost of education reduced, more schools exceeded EPS costs. By contrast, the caps on state, county and local spending adopted as part of LD1 started with what was being spent in fiscal year 2005, with room for growth every year. Those annual growth allowances range from around 3 percent for state government, 4.8 percent for municipalities and 4.9 percent for counties. School districts, on the other hand, not only had to start with a base that most already were exceeding, but increases in EPS have been limited. In fiscal year 2007, the total cost of education as defined by EPS was increased by 2 percent over the previous year, and in fiscal year 2008, it went up 3 percent. In fiscal year 2009, however, –the year the Legislature cut education aid to help balance the budget – EPS was cut by 1 percent. 27 were 51 percent over or more. The argument that schools are overspending if they are over EPS is being invoked more frequently in these tough economic times. The irony is the formula was developed to make sure districts were spending enough on education, not to serve as a spending cap. Those Learning Results outline what students should know in eight content areas – English; Health and Physical Education; Mathematics; Science and Technology; Social Studies; Career and Education Development; Visual and Performing Arts; and World Languages. EPS then breaks down how much it should cost, per student, to provide that adequate education. The special committee report did not say from where the money should come. “The important issues of how much of the necessary funding should come from the state, how much from the local communities, and what is the appropriate tax policy for raising funds were beyond the scope of its work,” the committee wrote. When the EPS formula was finally voted into law in 2003, it still did not have a funding source; that would come two years later when a state referendum supported by the Maine Municipal Association and statewide education associations forced the Legislature to adopt a goal of 55 percent state funding by fiscal year 2010 – a promise many state officials and legislators now say cannot be kept, at least not in the near term. Those who want to back away from the state’s commitment to funding 55 percent of K-12 education are saying the cost is not clearly defined. EPS is very formula driven, and while it does not cover everything, the formula generates an almost down-to-the-penny statewide cost for education, adjusted annually for inflation. It is easy to muddy the water on EPS because the public does not understand the school funding formula and how the costs are shared. 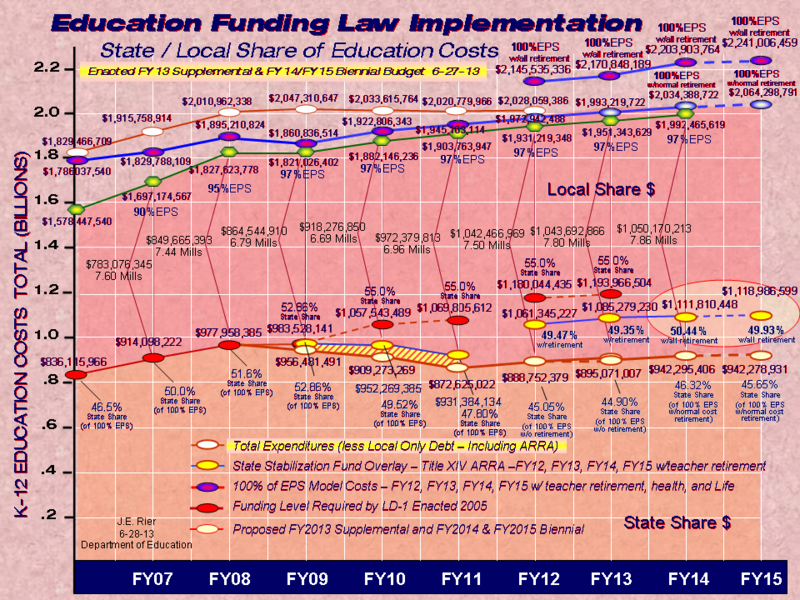 EPS defines the state recognized cost of education, which is split between the state and local property taxpayers. That split, statewide, was 53 percent state funded and 47 percent locally funded in fiscal year 2009 that ended June 30, but the actual split varies dramatically town-by-town depending on local enrollment and property values. Minimum receivers, for example, get as little as 6 percent of their educational costs covered by state aid, while some communities get as much as 82 percent. How much the state pays versus local property taxpayers starts first with the state determining through EPS what the cost of education will be for the coming fiscal year. In fiscal year 2009, for example, the total cost of education was determined to be $1.8 billion. The split was $983 million from the state and $837 million from the locals. In fiscal year 2009, the statewide mill rate needed was 6.55. Under the EPS law, cities and towns are required to raise the minimum mill rate to support their schools in order to get state aid. Those that can cover their school budgets with less than the required mill rate – largely due to the high assessed value of their property – get minimal state aid in the form of a percentage of their special education costs. In fiscal year 2009, that percentage of special education costs covered was 45 percent. There currently are just over 80 minimum receivers statewide. While the minimum mill rate system was designed to give more state aid to the communities that presumably need it most, those receiving less say the distribution formula is unfair. A town can be a minimum receiver, for example, because its property is assessed at a high rate, but the average income of year-round residents can be low. Using property valuations to determine a community’s ability to pay also means that when values go up year-over-year, state school aid goes down. Others argue the mill rate system is a good faith attempt to eliminate disparities between what communities are spending per pupil. The largest component of EPS is made up of instructional costs, including the salary and benefit costs for teachers and other support staff. The formula starts with the student count and then determines the number of teachers needed based on student-teacher ratios set in statute: 17:1 for elementary school; 16:1 for middle school; and, 15:1 for high school. Schools that have more teachers than the formula allows get less of an allocation per teacher. A complaint among administrators is the state counts teachers funded by the federal Title 1 program for disadvantaged students when looking at student-teacher ratios, even though Title 1 teachers are paid for with federal money and are supposed to provide extra help to those who need it. Including them in the count lowers a district’s student-teacher ratios and therefore means it gets less of an allocation. There are other student-staff ratios for education technicians; guidance staff; librarians; media assistants; health staff; principals and assistant principals; and clerical staff. How much each district gets per teacher and other staff varies by unit based on the staff’s years of experience and education level. The amount is further adjusted by what has become a very contentious regional adjustment based on Labor Market Areas (LMA). That adjustment allows the state to allocate more for teacher salaries in LMAs where higher salaries are paid. Critics say basing the regional adjustment on what teachers are currently paid assures that lower-paying districts will remain lower-paying because their allocation under EPS is lower. They also say it hampers their ability to recruit more experienced teachers. 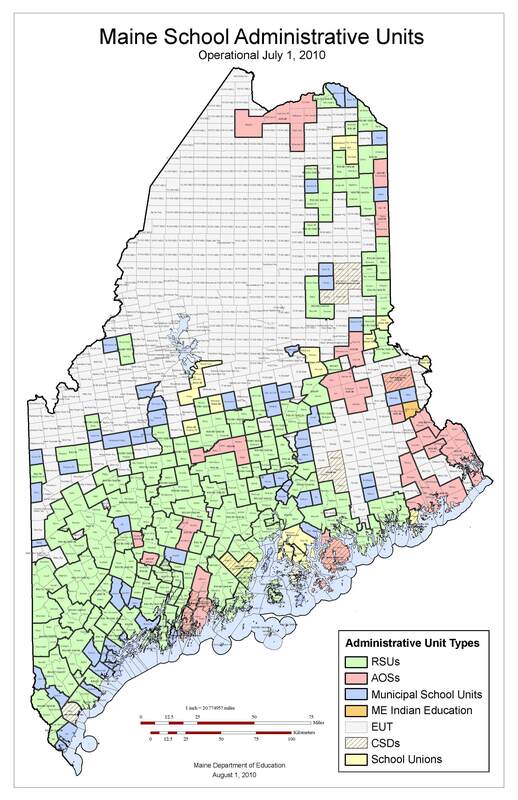 The regional cost adjustment also favors more populated parts of Maine, reinforcing the criticism that EPS favors urban over rural communities. The counter argument is that urban areas have a higher cost of living than rural areas and therefore salaries need to be higher. For example, starting with a base of 1.0 – representing the statewide average teacher salary – the Biddeford area gets allocations based on a salary cost index of 1.09 or 9 percent more than average. At the opposite end of the spectrum, the areas of Jonesport/Milbridge and Machias/Eastport have a salary cost index of .84 and therefore get 16 percent less than the average, with a spread of 25 percent from top to bottom. Another complaint is the regional adjustment also is applied to health benefits even though the cost does not vary based on where districts are located. Grade K-2 students with a weight of 1.1. Special Education used to be funded based on previous-year expenditures, adjusted for inflation. Now the formula is driven by the number of students served, with fewer dollars allocated if more than 15 percent of the overall student population is identified as having special needs. Federal funding is deducted from the EPS allocation. The allocations for K-2 students, technology and assessments are targeted, under the law. For the technology allocation, for example, that means districts have to submit a plan to the commissioner of education on how the funds will be used in order to get state support. Other funds are allocated by category, but can be used where needed in the overall school budget. That leeway to allow local school districts to make the ultimate decision on how to spend most of their money was deliberate, according to the 1999 special committee report that endorsed EPS. “A key component of the recommendations is that most of the funding identified should be made available without any requirements as to how the funds are to be spent. The local school districts would make that decision,” the report said. There are several areas covered by EPS that still are driven, all or in-part, by what was spent in the previous year versus what the state says districts should be spending. The allocation for transportation uses a hybrid method that looks at the density of a district and the miles school buses travel versus what the district actually spent on transportation for the most recent year available. If 90 percent of the most recent year is higher than the allocation produced by the density/miles traveled formula, the district gets the 90 percent. Career and Technical Education (CTE) and the Gifted and Talented program are outside of the formula, and while there has been a discussion about bringing CTE under EPS, the state has been reluctant to do so because the allocation would be more than what currently is being spent. The debate over whether EPS works as an equitable funding model continues today and will be the subject of legislative scrutiny when the 124th Legislature returns in January. As part of an annual review of aspects of the law, the Maine Education Policy Research Institute, which Dr. Silvernail co-directs, will be looking at some hot-button issues this fiscal year. The Education Committee also carried over a bill – LD #551, An Act to Improve the Essential Programs and Services Funding Formula – which is a concept draft that could be used to propose changes to the funding law based on concerns about its shortcomings. Perhaps the biggest threat to the law, as it now stands, is a drop in education aid, if state revenues continue to plummet. Lawmakers are about to start looking for ways to trim the budget in the current fiscal year, and a cut in school aid in the $60-million range already is being discussed in fiscal year 2011. Without money to support the state’s share of what EPS says districts should be spending, at minimum, on education, it is not clear whether the vision of the creators of the formula back in 1999 will ever be attained. Great article and analysis of the evolution of the EPS funding model and how it has morphed from an academic exercise in understanding the variables that go into K-12 school funding to its present use as a funding cap (at least by the Maine State Planning Office) for K-12 education. The only comment that I would add is that the original EPS model was supposed to have two additional modules to look at small and medium sized schools. The original intent was that these modules would have different and appropriate multipliers, cut points etc. to better allocate resources in rural and isolated schools so that those students would have access to similar resources as those students enrolled in large urban and suburban schools. I agree that this is an excellent article over the history, goals, and philosophy behind EPS. I have been troubled over the years of how EPS has been changed from defining an "adequate" education to becoming a spending cap under L.D.1. Every spring the state says that school districts are exceeding their spending targets. Usually much is not said in the news coverage about EPS and what it was developed for. As a teacher, it was interesting to find that health benefits allocation are also calculated under the same cost factor as salaries. This is unfair to those districts under the mythical 1.0 cost factor. Insurance costs the same in Biddeford or Machias. Cost factors should be the same across the state. The assumptions used under the current EPS for staffing levels, costs, and other things leave a lot to be desired. Jim Rier's comment about districts underfunding education if they do not exceed EPS by 5% t0 6%R was also interesting. EPS needs to be looked at and it should better reflect rural schools. A very interesting article that needs to be read by more people instead of listening to the state spin doctors. An important concern I have is that research about EPS needs to be conducted in parallel to the MEPRI research in order to be taken to the Legislature this year. The purpose to confirm facts and assumptions, look for differences in them, and also to suggest alternatives besides what MEPRI comes up with. These need to be ready for the education committee in the spring. I believe that the state has put too many eggs in one basket with MEPRI and research and other sources need to be looked at. Perhaps Gordon Donaldson or someone else is up to the task. I feel that this issues needs checks and balances with research especially after the school governance fiasco and the "research" behind it in 2007.